I just purchased the app after seeing it featured on Beautiful Pixels. The use case fits me perfectly. I usually have a vague idea of what I feel like having, but would probably try more drinks if I got a picture and description of what I was in store for. 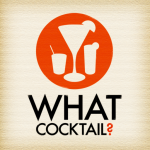 The descriptions of the drinks are wonderful – they make you curious without being vague or judgmental. I think I’ve already decided to try a Satan’s Whiskers next time I’m at a good bar. I’m really curious what drinks are included, though a full list might spoil the surprise. I hope the app gets updated to keep up with new trends and to give us some older drinks or more variety that got left out the first time. I’d like to see beer or wine come up once in a while, and my girlfriend is partial to Rusty Nails. In my testing, I got water suggested three times and coffee once, but that might be because I was looking for suggestions at 4 in the morning. Glad you liked What Cocktail? ! It’s such a delight to hear from the people for whom the app was created. Thanks for taking the time to send in your feedback – it’s much appreciated. You are right about the complete list. We keep that a secret because we’d much rather people take the time to try each of the recommendations. There’s enough variety to keep you busy. With cocktails, we like to think it’s about the quality. And yes, you might see the odd beer or wine pop up too. 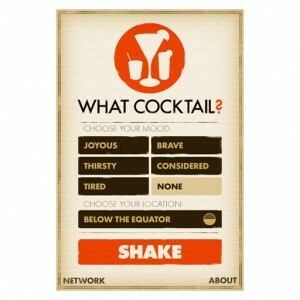 Not that we’d like to encourage excessive drinking but try the app at different times of day and in different moods. Have fun! If you are facebook inclined, post up pictures of you having fun with What Cocktail? Thanks again for the purchase and the comment.